The structural characterization of oligosaccharides still challenges the field of analytical chemistry. 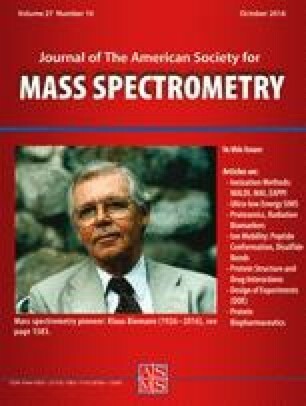 Tandem mass spectrometry offers many advantages toward this aim, although the generic fragmentation method (low-energy collision-induced dissociation) shows clear limitations and is often insufficient to retrieve some essential structural information on these molecules. In this work, we present the first application of helium charge transfer dissociation (He-CTD) to characterize the structure of complex oligosaccharides. We compare this method with low-energy collision-induced dissociation and extreme-ultraviolet dissociative photoionization (XUV-DPI), which was shown previously to ensure the successful characterization of complex glycans. Similarly to what could be obtained by XUV-DPI, He-CTD provides a complete description of the investigated structures by producing many informative cross-ring fragments and no ambiguous fragmentation. Unlike XUV-DPI, which is performed at a synchrotron source, He-CTD has the undeniable advantage of being implementable in a conventional benchtop ion trap in a conventional laboratory setting. The online version of this article (doi: 10.1007/s13361-016-1453-6) contains supplementary material, which is available to authorized users. Low-energy collision-induced dissociation (LE-CID) is by far the most popular approach in tandem mass spectrometry (MS) and is based on a slow thermal excitation by colliding ions with gaseous molecules and conversion of kinetic energy to internal energy [1, 2]. Nevertheless, in LE-CID, the predominance of glycosidic bond cleavages (i.e., Y and Z fragments and/or B and C fragments) and the lack of cross-ring cleavages often leads to the unsuccessful structural determination of complex oligosaccharides [3, 4]. In addition, LE-CID sometimes suffers from rearrangement ions, neutral losses, and internal fragments originating from multiple pathways, which together complicate the interpretation of tandem mass spectra and, as exemplified in , may even prevent the unambiguous assignment of numerous fragments. LE-CID has also been used in combination with infrared multiphoton dissociation to provide superior results . Other ion activation methods that exhibit selective advantages over LE-CID have been explored in recent years. Some methods involve ion–electron interactions as a means to activate precursor ions, such as electron capture dissociation , electronic excitation dissociation [7, 8, 9, 10], hot electron capture dissociation , electron-induced dissociation [12, 13], and electron detachment dissociation . These electron-based approaches are most frequently and most successfully performed with expensive Fourier transform ion cyclotron resonance MS instruments. When combined, these electron-based approaches can sometimes lead to stereospecific forms of chondroitin sulfate . Another activation method based on ion–ion interaction, electron transfer dissociation , has become very popular for proteins and peptides and, in contrast to free electron methods, is now available on many commercial instruments. Unfortunately, electron transfer dissociation is limited to the fragmentation of multiply charged precursor ions. This limits its use for the structural analysis of oligosaccharides because they predominantly form singly charged species (e.g., sodium cationized species) in positive ionization mode. Only a few examples of negative electron transfer dissociation of oligosaccharides exist . Tandem MS of anionic oligosaccharides has shown promise for acidic oligosaccharides such as chondroitin sulfate, but the labile sulfate group is often missing in the product ion spectra [17, 18]. Although cross-ring cleavages have been observed in negative ion tandem MS studies of functionalized oligosaccharides [15, 19], full characterization of glycan modifications is typically limited to relatively small oligosaccharides by means of a combination of chemical modification and tandem MS approaches [20, 21, 22, 23, 24]. Two studies recently highlighted the potential of extreme-UV (XUV) photons as a means to activate ions and resolve the structures of complex oligosaccharides by tandem MS [3, 25]. Ion–photon activation with UV photons leads to the absorption of a single photon with sufficient energy to induce the dissociation of precursor ions. These approaches include UV (400 nm > λ > 200 nm, 3 eV < E < 6.2 eV)  vacuum UV (200 nm > λ > 100 nm, 6.2 eV < E < 12.4 eV) [27, 28, 29], and XUV (100 nm > λ > 10 nm, 12.4 eV < E < 124 eV) . Compared with photons of other wavelengths, XUV photons far exceed the ionization threshold of trapped molecular ions and do not require the presence of any specific chromophore for absorption. Without exclusion of other relaxation processes, the fragmentation then predominantly occurs following a dissociative photoionization (DPI) mechanism . As shown in , the structural information provided by XUV-DPI on complex oligosaccharides is strikingly better than that obtained by LE-CID of the same compounds, and allows a complete sequencing of the oligosaccharides, including the positioning of lateral branching and labile modifications. Unfortunately, the scope and practicality of XUV-DPI is limited at the moment to the use of synchrotron radiation sources. Very recently, charge transfer dissociation (CTD), another ion activation method, was described as a promising alternative to the aforementioned methods . Chingin et al. described the use of an ion gun fed with air for the dissociation of multiply charged polypeptides precursor ions, and the concept was extended by Hoffmann and Jackson  for the fragmentation of singly charged peptide ions by use of a beam of pure helium cations. Helium CTD (He-CTD) is very attractive because, compared with the reagent air cations such as O2 +• and N2 +•, the electron affinity of helium cations (24.6 eV) is the largest of any singly charged cation. Notably, this energy is in the energy range used for activation by XUV photons, which suggests that He-CTD can be extremely promising as a method complementary to XUV-DPI. This experimental setup is not currently available commercially, yet a benchtop ion trap mass spectrometer modified with a saddle field source can be implemented in a conventional laboratory [31, 32]. In this work, we compared the fragmentation results obtained by LE-CID, XUV-DPI, and He-CTD for two classes of oligosaccharides. Both sugars are challenging to characterize because of the possibility of isomeric forms and the presence of labile modifications. The fragmentation pattern obtained by He-CTD shows remarkable similarity to that obtained by XUV-DPI. The two methods produce fragments resulting from a variety of glycosidic bond cleavages and cross-ring cleavages, allowing the unambiguous determination of the complex structure of the glycans. Promisingly, He-CTD thus opens the possibility of achieving high-energy fragmentation with an instrumental setting that, in principle, is more practical and affordable than other high-energy tandem MS methods. A pure oligogalacturonan with a degree of polymerization of 5 and a degree of methylation of 3 (DP5DM3) was produced from the homogalacturonan portion of highly methylated pectins  and fractionated by reversed-phase liquid chromatography as in . A hybrid agar–porphyran with a degree of polymerization of 6 (DP6) was produced as described in , except that no pretreatment by a β-agarase was applied. Two micrograms of the dried oligosaccharides was solubilized in 50 μL of H2 18O and incubated for 1 week at room temperature in the dark. Oligosaccharides were analyzed with the use of modified ion trap mass spectrometers. Samples were diluted to a concentration of 10 μg/mL and infused at a flow rate of 5 μL/min. Measurements were performed in positive ion mode on the singly charged sodium adducts. The nomenclature used for annotations is according to that in . Raw data were treated with mMass 5.3.0  (subtraction of the background). All the tandem MS spectra presented were obtained by our summing the signal for 1 min for each tandem MS technique. The experimental setup was developed at the SOLEIL synchrotron radiation facility at the endstation of the DISCO beamline . A bending magnet-based synchrotron beamline was coupled to a linear ion trap (LTQ XL, Thermo Fisher Scientific). An automatic shutter was used to synchronize the photon beam (tuned to 18 eV, 68.9 nm) with the trapped precursor ions. Precursor ions were isolated with a window of 2 Da and exposed to XUV photons for 1000 ms. Experiments were performed on the modified linear ion trap used for XUV photon activation tandem MS. Precursor ions were isolated with a window of 2 Da. The collision energy was set at 10 (arbitrary units) for the DP5DM3 oligogalacturonan and at 37 (arbitrary units) for the DP6 oligoporphyran, with an activation time of 30 ms.
A saddle field fast ion source (VSW/Atomtech, Macclesfield, UK), was interfaced with an AmaZon 3D ion trap (Bruker Daltonics) via a custom vacuum chamber cover. The instrument modification and working principle are highly analogous to those in previous work on a linear ion trap . Precursor ions were isolated with a window of 4 Da and exposed to the 6-kV helium cation beam for 30 ms. The helium gas flow was controlled via a variable leak valve to the saddle field source, and measured by the ion trap gauge (readout approximately 1.2 × 10-5 mbar). Figure 1 and Table 1 show the results obtained following LE-CID, XUV-DPI, and He-CTD activation of an oligogalacturonan consisting of five glycosidic units bearing three methyl groups (DP5DM3), isolated as [M + Na]+ species at m/z 945.2. Labeling of the reducing end of the glycan with 18O was performed to help annotate isobaric fragments. Fragments arising from the reducing end are expected to display a shift of 2 Da for the 18O-labeled species (spectra of 18O-labeled species are not presented). In the LE-CID experiment, among the 41 detected fragments, only 13 could be unambiguously assigned to the structure of the DP5DM3 oligogalacturonan (underlined in red in Fig. 1, spectrum A) and only five cross-ring fragments were detected. Sixteen peaks correspond to neutral losses (H2O, CH3OH, and CO2) of other fragments and do not provide any valuable structural information. Among the 13 assigned fragments, 5 led to a doublet with 18O labeling, which indicates that they have different origins. However, with LE-CID, the absence of 18O labeling is not absolute proof that the fragment contains the nonreducing end of the oligosaccharide. This is because double fragmentation may occur, as exemplified by the 19 fragments marked by a double cross in Fig. 1, spectrum A (noted as “DF” in Table 1). Among those fragments, the actual occurrence of double fragmentation is evidenced for 13 fragments (marked by an orange double cross in Fig. 1, spectrum A). One example is given by the ion at m/z 639.1. This fragment shows a doublet under 18O labeling conditions and thus can be interpreted only as a mixture of a reducing-end-containing fragment (0,2X3) and a 0,2X4/C4 double fragmentation (Table S1). The occurrence of double fragmentations complicates the interpretation of the spectrum and may even lead to erroneous assignments. The picture is strikingly different after XUV-DPI analysis of the same glycan (Fig. 1, spectrum B). The number of fragment ions observed is drastically increased. A systematic series of fragments are produced from both ends of the oligosaccharide, including numerous cross-ring fragments (0,2X n , 1,5X n , 0,2A n , 2,5A n ). The number of neutral losses is significantly reduced, and very few double fragmentations are observed. This is exemplified by the intense peak observed at m/z 537.1 in LE-CID, which can originate only from a double fragmentation (0,2A4/Y5 or 0,2A5/Y4), and is entirely absent in the DPI tandem MS spectrum. Together, these features simplify the annotation: 37 fragments were thus unambiguously identified (in red in Table 1). The glycosidic bond cleavages allow the retrieval of the osidic sequence, whereas the cross-ring fragments permit the differentiation of most of the hydroxyl functions and thus provide information on the branching pattern, the localization of the chemical modifications, and therefore the characterization of the exact isomeric form. The same oligosaccharide was exposed to the 6-kV He+ beam and subjected to CTD for 30 ms (Fig. 1, spectrum C). The first observation is that He-CTD produces a variety of between-ring and cross-ring cleavages, which shows remarkable similarity to the product ion spectrum observed under XUV-DPI activation conditions. As in DPI, double fragmentations are also drastically reduced, as exemplified here again by the absence of the fragment at m/z 537.1. The doubly charged radical species ([M + Na]2+●) at m/z 472.6, along with other radical ions (e.g., 0,2A5 2+● − H2O at m/z 434.2; 0,2X4 2+● − H2O at m/z 398.6), indicates that the two activation methods go through an electron detachment process and the production of a charge-increased radical intermediate. The lack of data acquired over a larger range of species prevents us from making generalizations about mechanistic differences between the two methods. However, the similarity between the CTD and the 18-eV DPI spectra gives us some idea of the activation energies available through He-CTD. The second glycan studied is a hybrid oligoporphyran, a class of sulfated oligosaccharides. Sulfation is one of the most labile modifications of polysaccharides and has a crucial impact on their biological and end-use properties [38, 39]. Sulfation modifications are often lost on LE-CID. Table 2 describes the fragments observed for the [M + 3Na − 2H]+ ion of the DP6 oligoporphyran for the three activation methods (tandem MS spectra and structures are presented in Fig. S1). On LE-CID, a predominant fragment is observed at m/z 1079.4, corresponding to the loss of H2SO4Na. Similarly to the previous example, the LE-CID spectrum contains few diagnostic fragments, among which only seven could be unambiguously assigned to the structure of the oligoporphyran. In contrast, the DPI and CTD spectra contain a variety of informative fragments with few sulfate losses. In both cases, most of the hydroxyl functions can be differentiated from the cross-ring fragments, thereby making possible an accurate localization of the sulfate groups. Some of the observed fragments indicate a slight difference in the activation mechanism between DPI and CTD. In DPI, a desulfated species was detected at m/z 529.3, corresponding to a doubly charged radical cation [M + 2Na − 2H − NaHSO4 − H2O]2+●. This species is totally absent in the CTD spectrum, but two ions corresponding to a loss of SO3Na (m/z 1097.6) and HSO4Na (m/z 1079.5) are produced in CTD. Although they require further confirmation, these observations may indicate that the electron detachment does not occur at the same position along the oligosaccharide in DPI as in CTD. These two examples illustrate that He-CTD shares the same distinctive characteristics as XUV-DPI in the fragmentation of oligosaccharides. Both activation methods are based on the formation of a radical cation from photoionization and charge transfer respectively. The intermediate radical cation fragments readily and leads to a variety of diagnostic ions. As illustrated for DPI [3, 25], CTD provides rich and informative spectra which allow the sequencing of oligosaccharides as well as the characterization of the branching pattern between subunits and the positioning of chemical modifications, including labile ones such as sulfation. All these features, obtained previously with use of a synchrotron beam to activate ions, are now reachable with He-CTD on modified benchtop mass spectrometers, which may considerably increase the use of MS in glycomics. Experiments were performed on the DISCO beamline at SOLEIL Synchrotron, France (proposal number 20150447). This work was partially supported by the Agence Nationale de la Recherche Scientifique, France (ANR-08-BLAN-0065). The authors acknowledge financial support from the National Institutes of Health (1R01GM114494-01). The opinions, findings, and conclusions or recommendations expressed in this publication are those of the authors and do not necessarily reflect the views of the National Institutes of Health. The authors thank M. Czjzek (CNRS-UPMC UMR 8227, Station Biologique, Roscoff, France) and M.C. Ralet (INRA UR 1268 BIA, Nantes, France) for providing the oligosaccharides.